When you arrive at Rossie, you will go into a large comfortable room with nice decorations, furnishings and a TV. There are no bars on the windows. You’ll be welcomed by friendly staff who will help you – they know you may be scared, upset or angry. You will then be invited into your welcome room where you can get settled, relax and chat with staff. We have to search you to make sure you do not have any unsafe items that may harm you, other young people or staff. Searches will be carried out either in your room, or the welcome room you are taken to when you first arrive. We will always ask you if you have anything you should not have and we use a hand-held metal detector to pick up any items we cannot see. During this, there are always two members of staff in the room with one searching. Male staff will search boys and female staff will search girls. During full body searches, you are given a dressing gown to cover yourself and protect your dignity. We understand being searched will be difficult for you and staff will be as sensitive as possible at all times. Staff will explain the purpose of the search and are happy to answer any questions you may have. 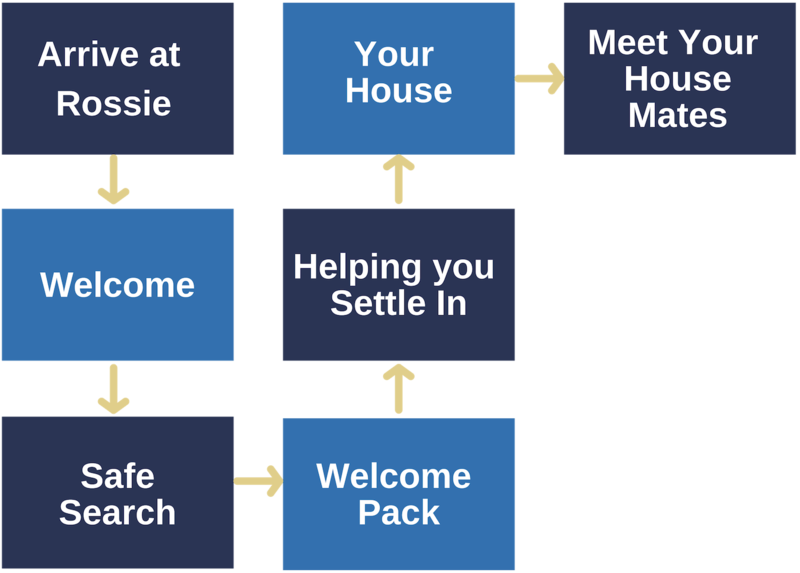 You will be given a Rossie Welcome Pack to help you feel wanted and important. This will include some toiletries, a dressing gown, a Rossie Bear, fluffy blanket, slippers and leaflets that have lots of useful information about Rossie. We want you to be able to personalise your room so, we give you an allowance for the decorations you want, and staff will help you with this – we want you to feel comfortable and at home in your new surroundings. Staff will keep speaking to you so that you know what is happening each step of the way when you come into Rossie. They will tell you the name of the house you will be staying in, how many other young people are already living there, and what your room will be like. Staff will take you to into your house and show you your bedroom. Staff will do everything possible to help you relax and feel welcome – you can ask as many questions as you want. It’s time to meet the other young people who also live in your house. You will also be able to meet the staff. At your pace, and when you are ready, we will introduce you to the young people and your Key Worker from the care team. You will make friends with some of these young people, and some may be life-long friends.